Mondays always seem to be the best studio days. Maybe it’s because the weight of the week hasn’t set in, or that the last Thursday is just far enough away that we’re motivated to try to get more work done. Whatever it is, yesterday was a particularly good example of getting things done at CIVIC SPACE. On the table, we’re starting work on a plaque project we’ve had on the back burner for quite a while, and we’re also beginning prep work for a t-shirt project we’re planning for the new year. As part of the plaque project, we’re going to be casting a laser cut template in plaster, but first making a rubber mould. 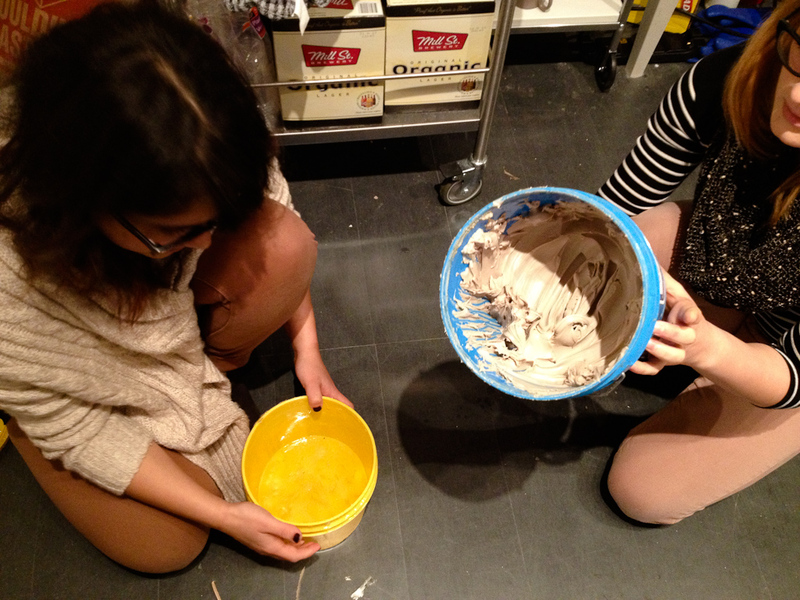 Above, Hiba and Laura open up the containers of rubber mould mixture that Hiba had left over from a project last year. The paste was still good, but the clear liquid is now a solid, so Sculpture Supply Canada, here we come. 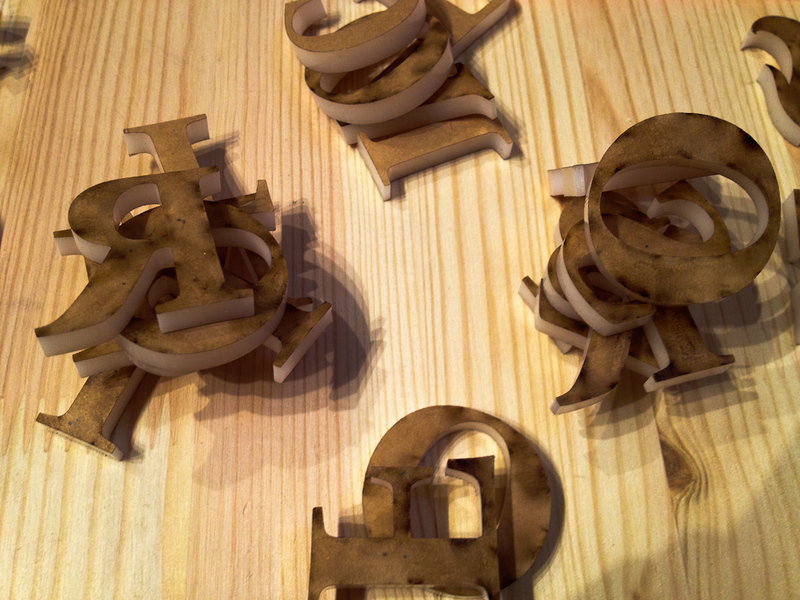 With the prospects of making a frame in which to make the rubber mould, we went back to the laser cut acrylic. 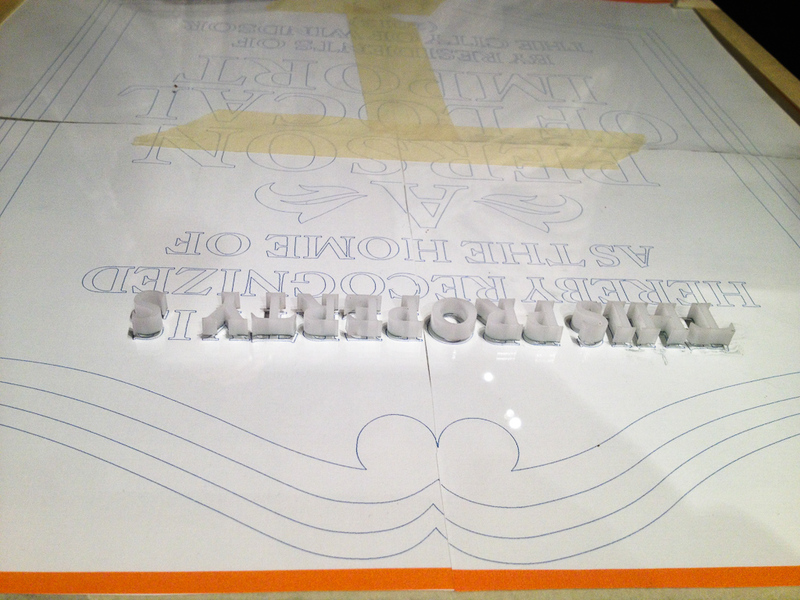 We’ll be transferring the letters and shapes from the laser cut onto a flat surface, then cover that with the rubber mixture, and then making plaster casts from that. Above, Hiba surveys the work to be done. 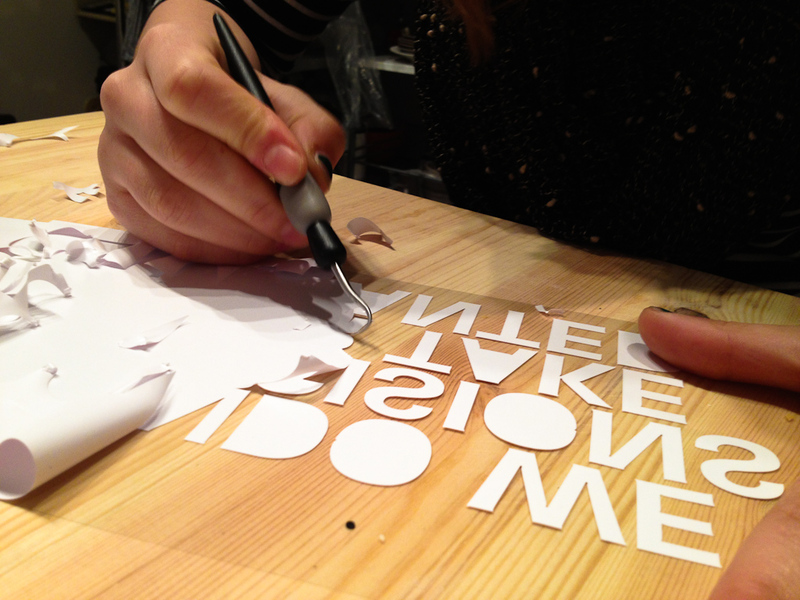 The plan will be to remove each letter from the template and then super glue them to a plate of glass. 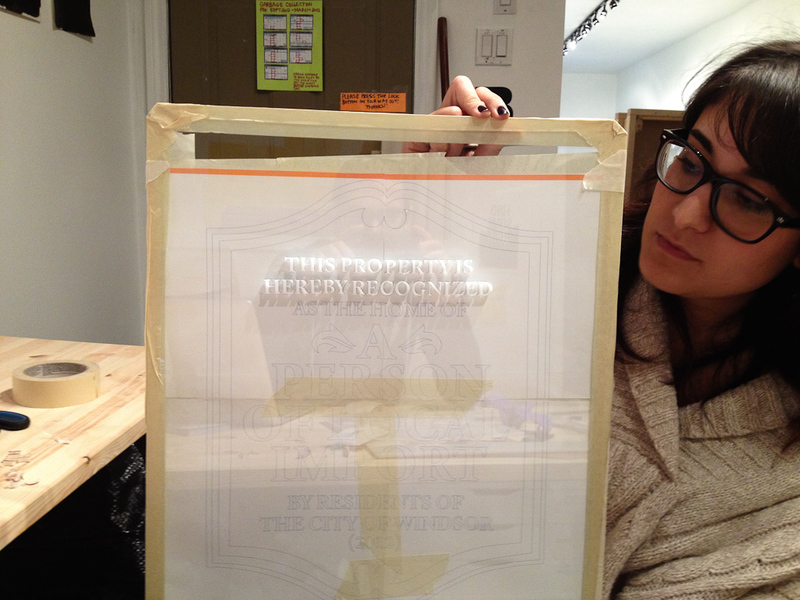 At first, Hiba worked with the original sticky substrate as a base for the glass and a template to align the letters. The stacks of letters. The burnt-brown surface is basically the paper / tape used to protect the acrylic. 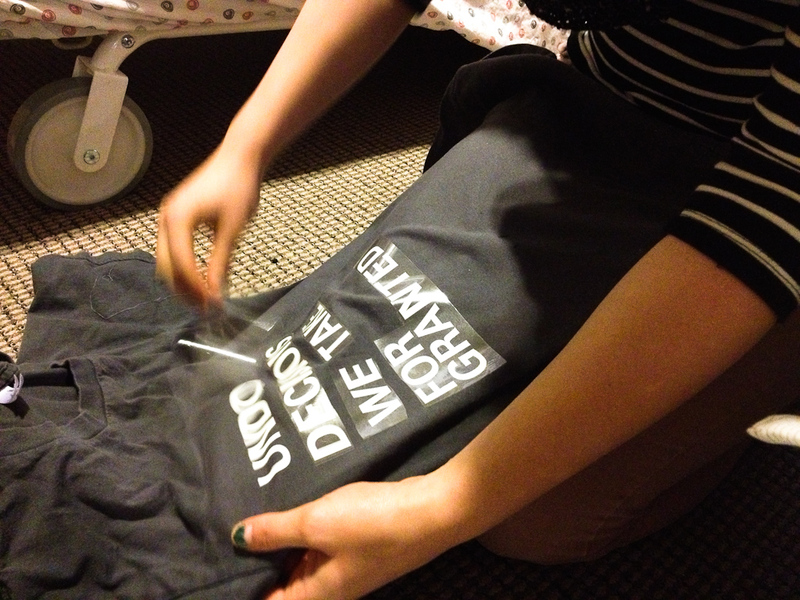 Meanwhile, we also got a heat press for this t-shirt project, so Laura set out to test it. 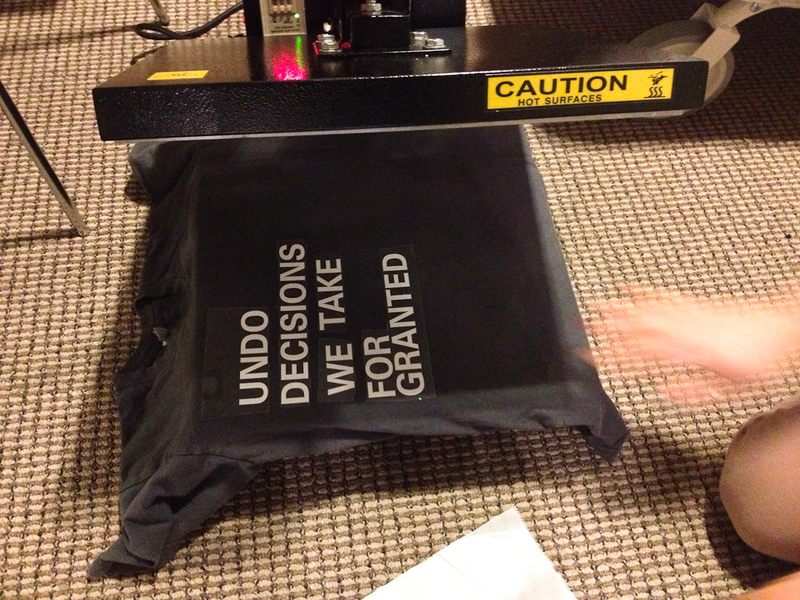 The t-shirt vinyl cut pretty well and the initial transfer test went well. 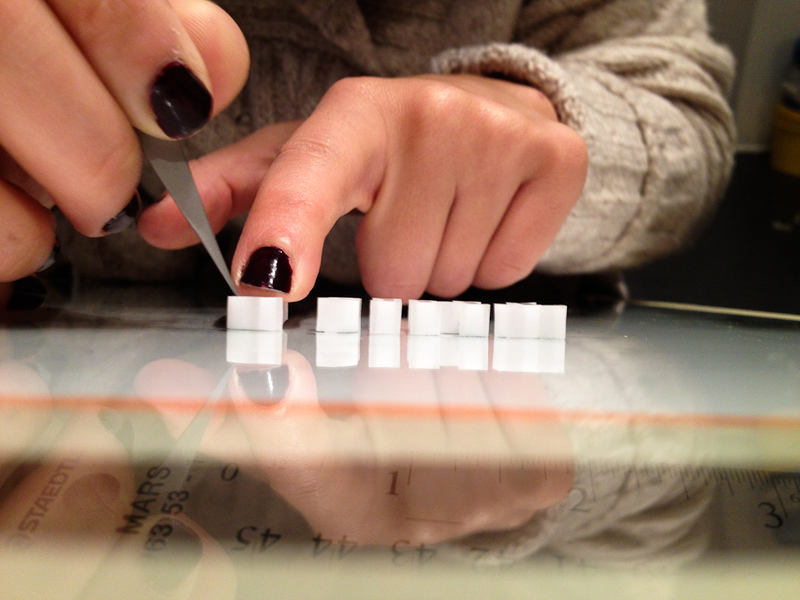 Another test and we quickly realized we would have to cut everything in reverse. So, back to the cutter. We still need to tweak the offset to avoid those curved kinds of corners. 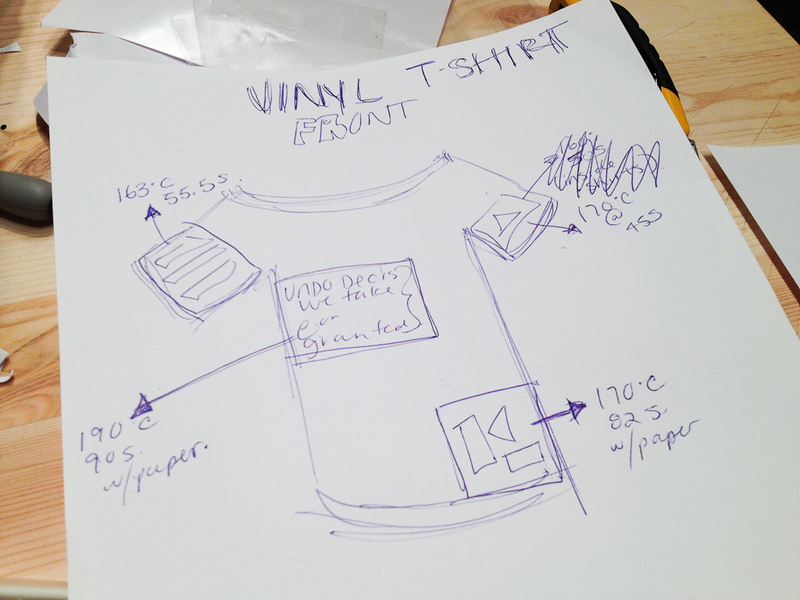 So, with the vinyl cut in reverse, we take on a t-shirt test. 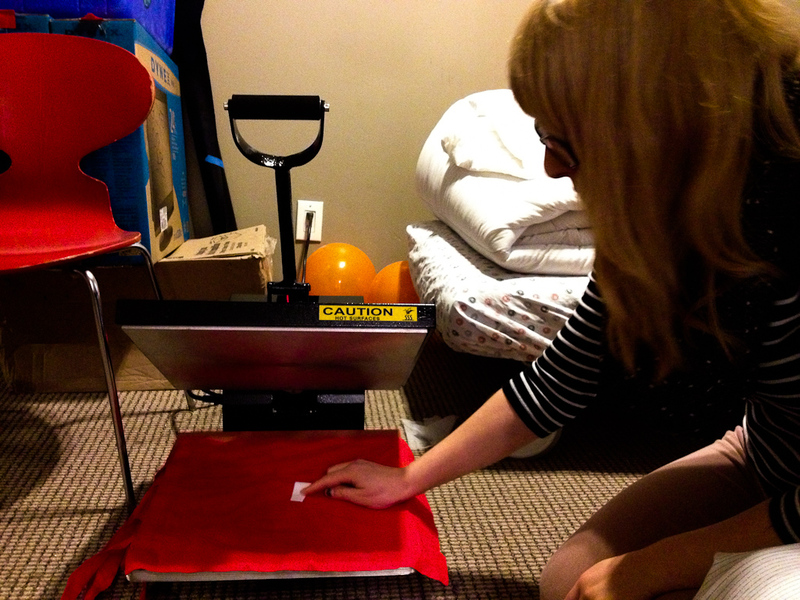 Laura clamps down the press. 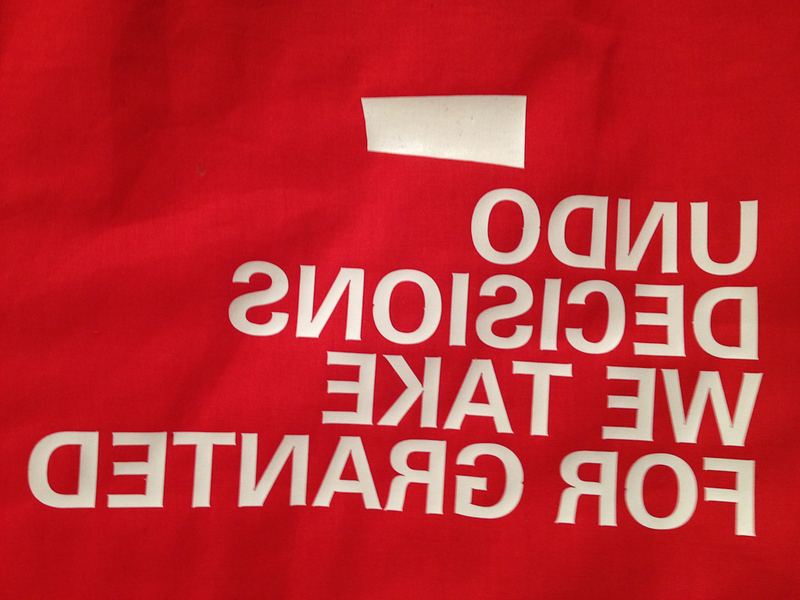 And we realize we’ve somewhat over-cooked the shirt. 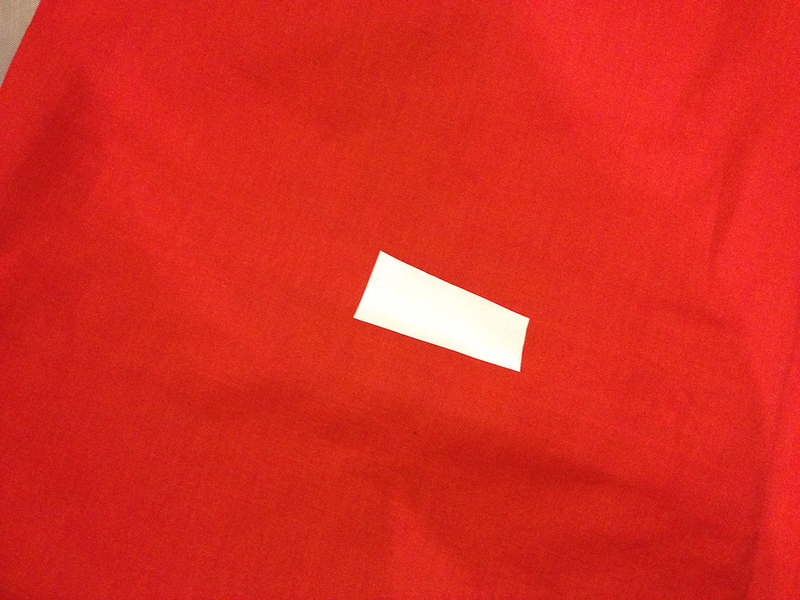 The substrate for the vinyl comes off, but the shirt is left with a big light-coloured square from the press. 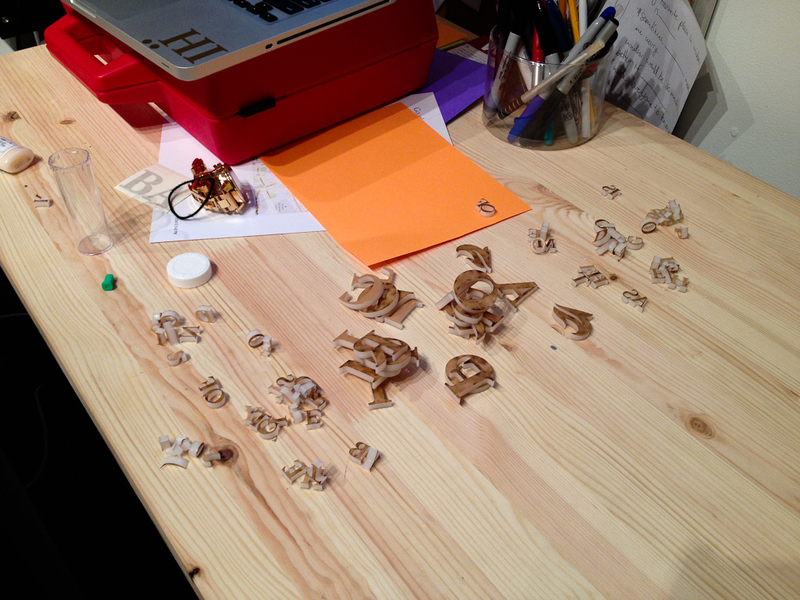 After remembering that we had to actually apply the letters not in reverse in order to get the mould the way we wanted, Hiba had to remove a handful of letters, glue them back together and then start over again. 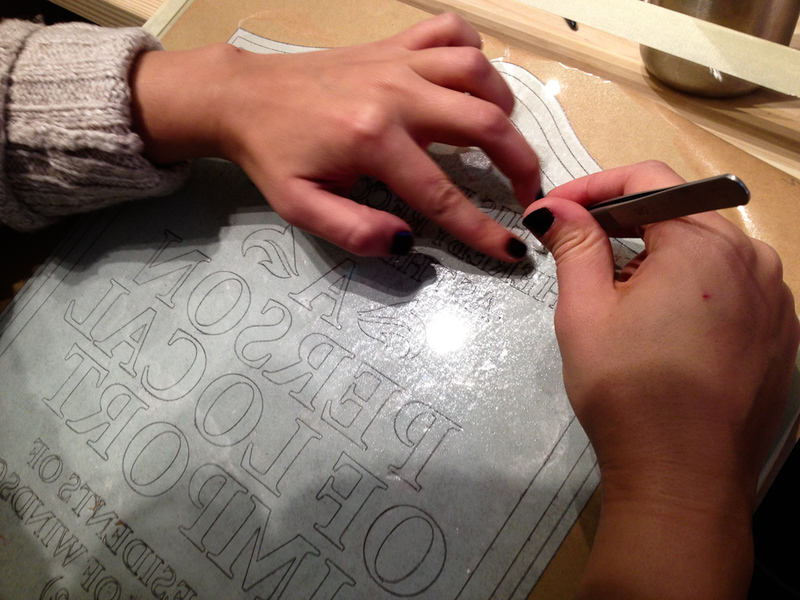 This time, we printed out the original laser cut template and taped it to the back of the plate of glass. Now, it’s a better template and will make a really good mould. Because of the rubber mix, we wanted to get as flat a surface as possible for the letters to affix to, which will avoid any weird casting problems with the plaster down the road. All looks good, just that R in the second row that broke apart before we even started. 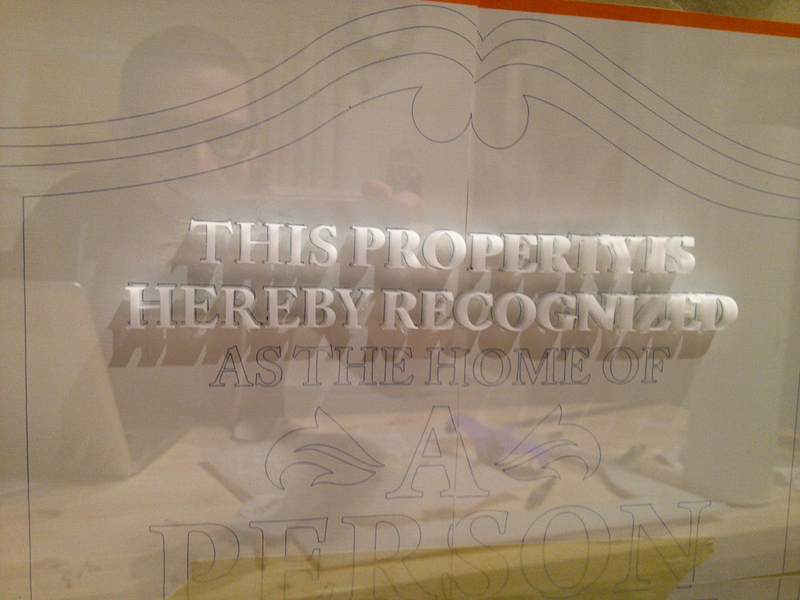 However, we’re continually impressed with how detailed the laser cutter was. Previous PostPrevious Panel Discussion: What is our Urban Imaginary?